Having consumed more non-fiction, theoretical and academic books than I’ve ever read in my life, I thought I’d take a break and read a fictional one over the Christmas period. However I wanted to read a book with subject matter relating in some small way to my research. Just before Christmas I saw a programme on BBC One about the rise of digital books and the decline of printed ones. Under the strand ‘Imagine’ and presented by Alan Yentob the programme asked the question “Books – The Last Chapter?“. 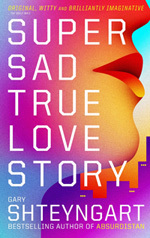 Yentob interviews author Gary Shteyngard about his book Super Sad True Love Story which has a very poignant satirical vision where, as the Guardian reviewed, “the information age has reached maximum insanity. Everyone works in media or credit. People don’t really like talking much any more; they prefer streaming information about each other on their “apparati””. So I thought this was my book for the Christmas brake. But in answer the title of the Yentob TV programme I downloaded the book from the internet and read it on my laptop. It’s a very well written book which is told through the two main characters’ communications, the male’s traditional (diary) and the females digital (online), which is used to contrasts their different lives, ages, personalities and personal experiences. It was very refreshing to read some fiction. Having read finished this I’ve now moved back to the academic books. 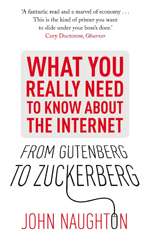 I’m a great admirer of John Naughton for his straight forward and insightful columns in The Observer and his new book ‘From Gutenberg to Zuckerberg: What you really need to know about the internet’ which I’m reading now. It’s a book that is made up of nine ideas about the internet. You may wonder why someone who is knowledgeable about the web and digital media would want to read such a book but this is because of Naughton’s personal interpretation of the subject. Here’s is an interview with him where he briefly explains the ideas in the book.